Up until the end of 2014, Castle Street enjoyed strong connections with the nearby congregation of Castle End Mission, with whom we shared our evening services. 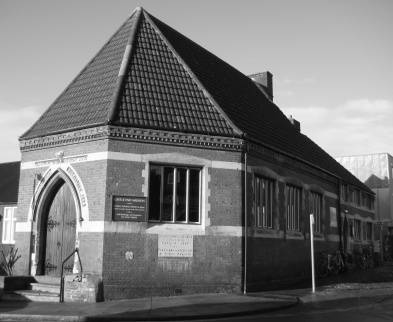 Castle End Mission was a small independent congregation linked to Emmanuel United Reformed Church in Trumpington Street. The link dated back to 1910 when an Associate Minister of Emmanuel Congregational Church was appointed with special responsibility for Castle End Mission. The Mission began as a centre for the education of working men, many of whom could not read or write, in the impoverished Castle area of Cambridge. The first meeting took place in 1879 and the driving force in its early development was the redoubtable Mrs Whibley. It was initially called the Castle End Men’s Morning School. The present building was opened in 1884 as the Castle End Mission and Working Men’s Institute. It has always been a centre of community activity in this area of Cambridge and continues to provide facilities for a large number of community groups. If you would like to book the rooms at Castle End Mission, please visit the Emmanuel United Reformed Church website.